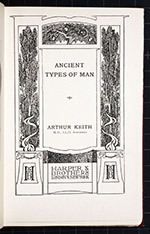 Ancient Types of Man. London & New York: Harper & Brothers, 1911. 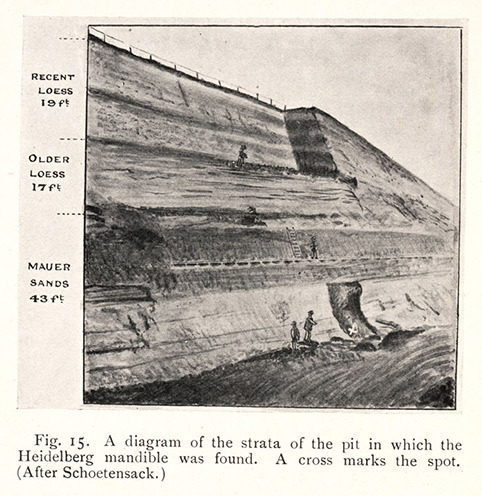 In 1907, a workman at the Mauer quarry, near Heidelberg, found a sturdy human mandible, or lower jaw bone. The discovery was examined by Otto Schoetensack (1850-1912), a professor at Heidelberg, and he concluded that the jaw did not belong to Cro-Magnon, Neanderthal, or Pithecanthropus, the three human forerunners known to date. So he assigned it to a new species, Homo heidelbergensis. We now recognize Homo heidelbergensis as the ancestor of both Neanderthals and modern humans. 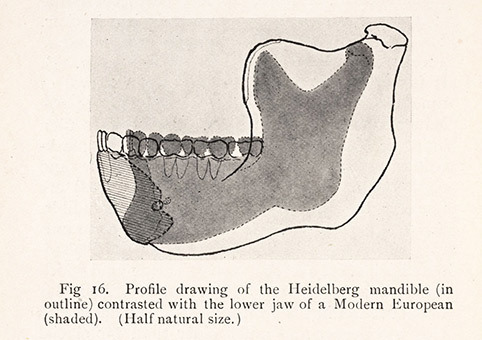 Schoetensack announced Heidelberg Man in a pamphlet in 1908, which is very scarce and not in the Library’s collections; we display instead another early view of the jaw, where it is shown in outline and compared to a smaller modern jaw.